The inner east suburb of Alexandria has a history of factories and manufacturing and it was once known as a major industrial area in Australia. In recent years, people have been moving into this suburb and transforming the area into a delightful residential community. So when I drove through the streets of Alexandria recently, there was an appealing mix of cottages and terraced houses and an assortment of offices and manufacturing businesses. My companion and I had heard about Bitton Gourmet and we were keen to try their lunch menu. As we walked from the car towards the cafe, we noticed how green this area was. Stunning emerald-coloured trees lined Swanson and Copeland Streets, dogs played in the Harry Noble Reserve opposite Bitton's, a mum was pushing a child's pram and later, the toddler pushing his own pram. It was a tranquil setting. We hoped Bitton Gourmet would add to the experience of this day. Bitton Gourmet, a French restaurant whose reputation precedes it, has been around for 16 years. Bitton Gourmet is a stand-alone establishment in this leafy suburban area. It is not situated near a shopping centre or other eateries so there is no competing noise or traffic in the vicinity. This is a big tick from me as it added to the relaxed mood for our meal. We were the first to arrive for lunch and were greeted by a vivacious waitress. We could choose any of the tables so we sat opposite the large window overlooking the reserve. Bitton's is an airy, inviting cafe with a striking red, white and black interior. Bitton Gourmet produces their own gourmet products which are stocked in Australia and overseas as well as being sold direct from this cafe. David Bitton's cookbook and products adorn the shelves of this establishment. They have recently opened their second cafe at Oatley in Sydney's south. Having spied the dessert menu first in order to decide our choice of mains, I chose Fettucine and Confit Masala Chicken and Coriander Pesto, the masala and pesto being Bitton's own products. When the meal arrived, I was initially surprised when I saw the chicken as one piece on top of the silky pasta as my expectation was of small chicken portions. When I tasted the dish, though, it was absolutely spectacular. The pasta was deliciously smooth with the added nutty bits of the pesto. My companion's choice was the Grass Fed Beef Burger with tomato, onion and mayo on a brioche bun served with pomme frites. The inclusion of pickled vegetables in the bun conveyed this burger above the level of the ordinary. Next were desserts. The choice was difficult as they all sounded delectable: a lemon tart with soft meringue and mixed berry compote, chocolate fondant with dark cherry ice cream, crepes with pistachio ice cream and hot chocolate sauce or a selection of three French cheeses with a baguette. After some deliberation, I chose the Bread and Butter Pudding with Crème Anglaise and Vanilla Bean Ice Cream with Bitton's orange jelly, which is a syrup to be drizzled over desserts. 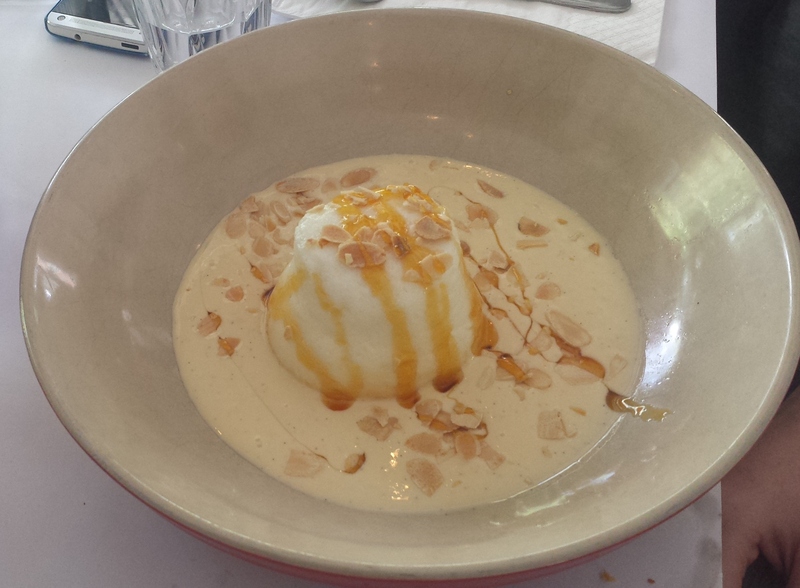 I asked the waitress whether this pudding had liqueur in it as I dislike the addition of liqueurs in desserts. She checked in the kitchen and I was told there was no liqueur in it. When it arrived, I was amazed. Use of croissants for the bread mixture with the crème and ice cream made it a simply divine dessert. My companion ordered the Ille Flottante described as a floating island pavlova without the outer crust, accompanied by Crème Anglaise, Toasted Almonds and Bitton's orange jelly. She demolished this dessert in no time and her smile said it all. As I walked through this cafe, I noticed a play area out the back for children. This is a bonus for parents who want to dine and keep an eye on their kiddies. Before we departed this wonderful eatery, a nice surprise arrived: mni crème brulees, which are often presented to customers at the end of their meals. These sweet little mouthfuls were a delicious conclusion to a wonderful lunch at Bitton Gourmet. 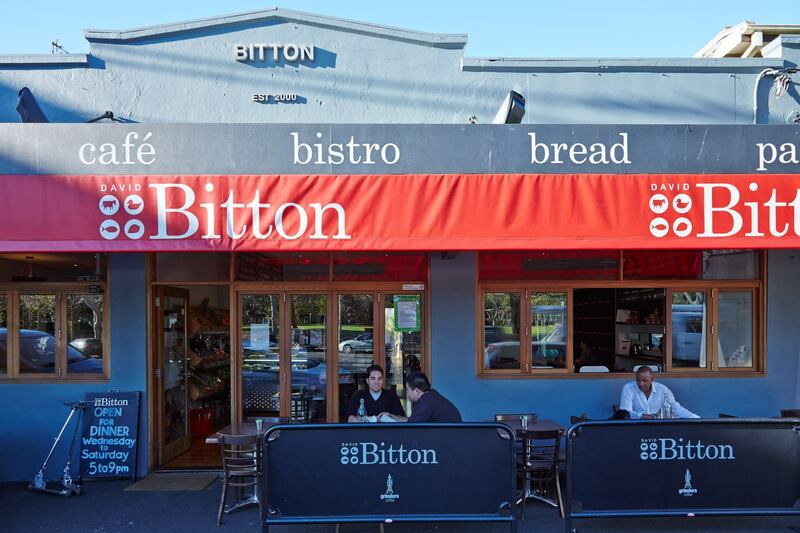 Bitton's have a $35 per person two course lunch special Monday to Friday. They also host a variety of events such as The Chef's Challenge on Thursday nights whereby the Head Chefs from the Alexandria and Oatley cafes will take a main ingredient and create a fabulous dish to serve that night as a special. The ingredient may be quail one week, zucchini flowers another week. Great value at $25 per person. On Wednesay nights, Bitton Gourmet hosts Locals Night where any main course item from the a la carte menu is $20. Melbourne Cup event at Bitton's is Tuesday 1st November and the lunch will be $60 including a glass of NV Canard Duchene. Check their website for other events. If you wish to eat this superb food in the comfort of your own home, Bitton's have a home delivery service from their Alexandria store via Deliveroo and Uber Eats. This is a cafe/restaurant I will definitely return to. David Bitton is French with a Moroccan background and he emerged later to chat to customers. The staff were very helpful and friendly, approaching customers to enquire how their meal was. I had no complaints as my companion and I felt very satisfied with the food.